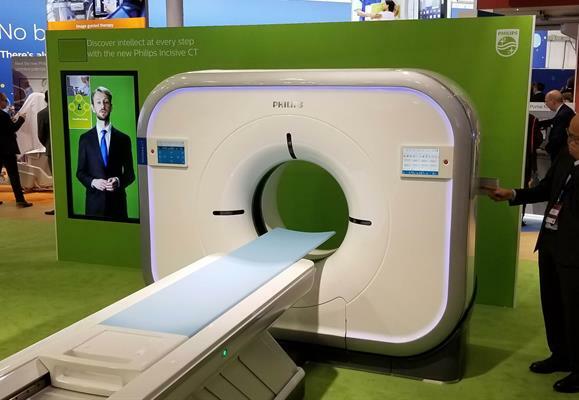 March 1, 2019 -- VIENNA - A multislice CT scanner called Incisive is among the new product launches being featured in the booth of Philips Healthcare at ECR 2019. The company is also promoting other recent product launches, including a new ultrasound scanner, mobile C-arm, and advanced visualization software. Incisive is the result of a development program that sought to give users a scanner that's more economical to operate, with lower total cost of ownership over the life of the scanner. A major new feature is a new Tube for Life guarantee, in which Philips will replace the x-ray tube of any Incisive CT scanner at no additional cost. Philips' Incisive multislice CT scanner. Philips estimated that this will save an Incisive user some $400,000 in tube replacement costs over the life of the scanner; a normal scanner might require three tube replacements over its lifetime. But Philips believes the vMRC tube that comes with the scanner will carry a longer life span. Incisive is also available with the company Technology Maximizer program, which keeps customers up to date with the latest technologies through regular upgrades of components and software. Other features include Philips' DoseWise Portal radiation dose management software, iDose4 algorithm for reducing image artifacts, and metal artifact reduction for large orthopedic implants (O-MAR). Incisive comes in two configurations: a model with 2-cm detector width and one with 4-cm detector width. It is available in 32-, 64-, and 128-slice configurations. The scanner is being launched globally at ECR 2019 and has the CE Mark as well as U.S. Food and Drug Administration clearance. It will be introduced in major markets in Europe and Asia in the first half of 2019, and later rolled out to other markets. In other CT news in its ECR booth, Philips is discussing results regarding the economic value of performing spectral CT with its IQon Elite scanner. Some sites have found that using spectral CT results in 34% quicker time to diagnosis, according to the vendor. Philips is also highlighting Epiq Elite, a new ultrasound scanner that was launched a few weeks prior to ECR 2019. The scanner comes in two configurations: Epiq Elite for General Imaging is tailored to the specific needs of vascular assessment, while Epiq Elite for Obstetrics & Gynecology is designed to provide excellent image quality and lifelike 3D scans for better fetal assessment at all stages of pregnancy. Epiq Elite includes the company's Ultimate Ultrasound Solution for Vascular Assessment software, which gives users insight into the progression of vascular disease by combining 3D and 4D imaging. With xMatrix transducers, users can use Epiq Elite to acquire 3D vascular images that enable clinicians to easily visualize vessels directly and evaluate the spatial location and composition of plaque. Epiq Elite began shipping two weeks prior to ECR 2019. Philips is highlighting a number of new transducers for the scanner at ECR 2019, including XL14-13, an xMatrix linear-array probe for vascular imaging that has 56,000 elements. Other probes include MC70-2, a miniature microconvex probe for intercostal access and interventional procedures, and LI2-3, which has been enhanced with better ergonomics. Zenition is a new mobile C-arm that Philips launched just prior to ECR 2019. The system brings to the mobile C-arm segment advanced technologies first pioneered on the company's Azurion interventional angiography system. These include a tablet-like user interface and a simplified workflow that enables an operator who has been trained on one system to move easily to another. Zenition sports a compact design, is able to remember C-arm positions, and includes BodySmart software that captures fast and consistent images out to the edge of the image intensifier or flat-panel digital detector. Philips believes the feature can reduce the need for C-arm repositioning by 45%. Zenition uses the same image processing algorithms found on Azurion, while MetalSmart software adjusts contrast and brightness to improve image quality when implants are present. The C-arm is available in two different options for detector and image intensifiers, and like the Incisive CT scanner, it can be purchased with the company's Technology Maximizer program. On the software side, Philips launched a new version of its IntelliSpace Portal 11 advanced visualization software at ECR 2019. The new version includes updates that improve workflow and facilitate secure data sharing between hospital networks. It also includes a nuclear medicine viewer from imaging software developer Mirada Medical.